MS is thought to affect more than 2.3 million people worldwide. While the disease is not contagious or directly inherited, epidemiologists’; scientists who study patterns of disease, have identified factors in the distribution of MS around the world that may eventually help determine what causes the disease. These factors include gender, genetics, age, geography and ethnic background. Jack Osbourne - son of heavy metal icon Ozzy Osbourne and television personality Sharon Osbourne has been in the spotlight for many years, but now he is turning the spotlight on a topic important to him - multiple sclerosis. Jack learned he has a relapsing form of multiple sclerosis (RRMS). However, Jack is not alone when it comes to raising awareness-- Miss Kentucky 2014, Ramsey Carpenter, is another public figure who also wants to share her RMS story. Together, they are joining forces to show that while RMS is a part of their lives, it is not controlling their lives. Recently, I had the chance to talk with Jack Osbourne and Ramsey Carpenter who shed light on the disease they both have - relapsing-remitting multiple sclerosis. 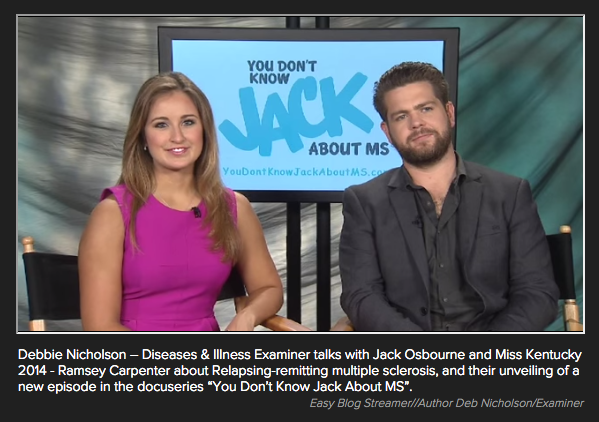 Together they are unveiling a new episode in an online docu-series about living with the disease, called - you don’t know jack about m-s. In May 2012 just a couple weeks after the birth of his daughter, he had received the diagnosis of MS. “It was really kind of strange. You go from this really big high having a baby and all of a sudden you end up in a hospital and a doctor is telling you, you have MS. It was a pretty difficult pill to swallow at the time,” said Jack. Jack had educated himself about the disease and got on a treatment plan and things got back pretty much to normal according to Jack. "I realized it can be manageable and I just had to be a little proactive about how I was going to achieve that,” he said. After experiencing symptoms she knew something was wrong. On August 25, 2010, Miss Kentucky 2014 Ramsey Carpenter was diagnosed with relapsing-remitting multiple sclerosis (RRMS). Life may have changed for Ramsey but she took this experience and changed it into a positive. She declared “MS Awareness” as her official platform in the Miss America pageant to increase visibility of a disease that is so commonly misunderstood. There are a lot of myths and misinformation about this chronic, unpredictable disease of the central nervous system. A couple years ago Jack partnered with Teva Neuroscience and kicked off You Don’t Know Jack About MS® campaign to raise awareness about multiple sclerosis (MS) in the United States and provide valuable resources to the MS community, in response to the evolving needs of the community. “we decided to create an awareness campaign and we didn’t want to do the typical psa head talking campaign so we decided to go down the webisode and make a bit of infotainment’, said Jack. Initially, the idea was to follow Jack in his day to day life and living with MS. “As things evolved the spotlight has now shifted the spotlight on other individuals within the community of MS on what they’re doing and how they are managing. We had spoken to doctors and other patients the whole purpose behind it is awareness letting people know what MS is, how it affects people and offer up suggests on what you can do to live a pretty manageable life,” said Jack. You are not alone. Don’t feel like you need to be lonely in this, feel free to reach out to your family and friends have that great support system. That is really something that is going to help you stay positive and also help you along the way to educate yourself through things like the “You Don’t Know Jack About MS®.” website and other resources and information,” said Ramsey. Jack was diagnosed with relapsing remitting multiple sclerosis (RRMS), the most common form of MS, in 2012. The diagnosis came just three weeks before he and his wife, Lisa, had their daughter, Pearl. Since his diagnosis, Jack has worked as a passionate MS patient advocate, speaking out about the need for MS research and greater awareness. In 2013, Jack participated on the TV dancing competition Dancing with the Stars, earning a third place finish and demonstrating how he maintains an active and healthy lifestyle despite his diagnosis with RRMS. That same year, Jack was honored at Nancy Davis’ 20th Annual Race to Erase MS Gala for his courage in announcing his diagnosis, as well as for acting as a role model to others who are living with MS.
Miss Kentucky 2014 Ramsey Carpenter was diagnosed with relapsing-remitting multiple sclerosis (RRMS) after she experienced numbness in her hands and feet. She was first told her symptoms were stress-related; however, when the symptoms re-emerged – accompanied by other symptoms – while she was playing the fiddle for her grandfather’s birthday, she knew something was wrong. When Ramsey started to play, she began to feel numbness and tingling in her hands. Later that year on August 25, 2010, she was diagnosed with RRMS. Besides her future goals, involvement with the National MS Society is also important to Ramsey and she tries to stay active in the MS community any way that she can. She is passionate about bringing people into the MS movement and continues to spread awareness by connecting with other MS patients and trying to make a difference in their lives. Ramsey seeks to take her passion and personal story into the national spotlight to raise MS awareness. Her platform issue for the 2015 Miss America pageant was MS Awareness and she was awarded the Heather French Henry Quality of Life Award for her outstanding work on the platform. In addition to her accomplishments in raising MS awareness, Ramsey also made the top 12 finalist list in the pageant and the favorite contestants list. *Ramsey’s story is representative of her personal experience. RRMS treatment results and experiences are different for every patient. It is key to work with your neurologist to find the treatment option that works best for you and to gauge your activity based on your personal ability.